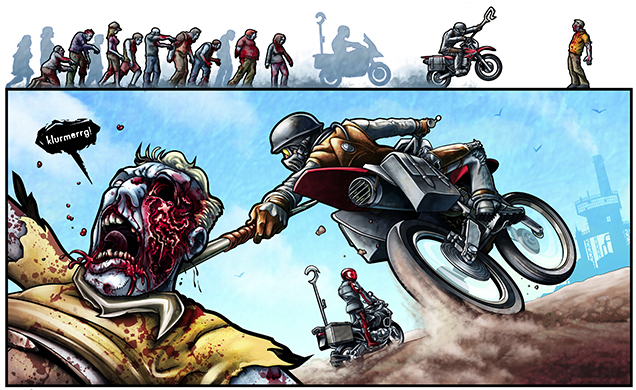 Hey do yourself a favor and head over to http://www.lostdogsmc.com to check out my buddies ultra-cool zombie intense super apocalyptic web comic. He’s updating regularly, so follow along. Don’t tell him I told ya so, but his art is fantastic. Description: I thought that if I have folks listed in my Links section that I might should at least introduce them. So Josh was the first one to pay me off. Joshua Janes is a talented artist in is own mind. Well and mine too. 😉 What I love about Josh’s work is his dynamic compostions with flawless composition with incredible colors. Now Josh’s work is great in pencil form but for me his work rushes to life when color and textures are added. Take for example the piece below, the scale textures that flow with the form are simply incredible. Look for more of these types of Posts, featuring other artists, in the future.